Two small liberal arts colleges in Vermont will close in a few months, another will stop teaching students at the end of this semester, and one more is on probation. At the heart of each school closing is a troubling financial picture, which is tied to another factor: the school’s accreditation. For colleges and universities in New England, that stamp of approval comes from the New England Commission of Higher Education. The commission's president, Dr. Barbara Brittingham, told Vermont Public Radio that she thinks demographics are at the heart of why so many colleges in the region are struggling. However, Brittingham said, it isn't only schools around New England contemplating their future. "This is a time of great change. It's a time when the public has questions about higher education, when people have become acutely aware of the cost of higher education and, in many cases, student debt," she said. "So I think every institution — public and private, large and small — is thinking in fairly concerted ways about what is their future." The New England commission's standards for accreditation are reviewed each decade, Brittingham explained. But when Mount Ida College, in Massachusetts, abruptly announced its closure last year, Brittingham said that spurred the commission to examine how it handles "financially fragile institutions" and to release a statement on changes made. However as to whether the standard for what allows a school to maintain accreditation should be lowered, Brittingham said that doesn't seem necessary. "I think the commission feels that the bar is set at about the right place," she said. "In other words, the institution needs ... to have sufficient financial stability to offer, and capacity to offer, a quality education to a student." Brittingham added that while the commission has monitored schools that rebuilt financial stability, when it seems to the commission that the quality of programs or services has suffered then it's necessary for them to step in. And if a school does ultimately close, Brittingham said she knows that decision's impact goes beyond the confines of the campus and is often challenging for many stakeholders. "When a college closes, that is a very, very painful thing for the entire community. Certainly for the students who are there, but I know also — from hearing from people directly, from reading social media, from reading the news — that it's painful for the alums, certainly for the employees and for the community," Brittingham said. "These schools are located in small towns in many cases, and when a college closes that is a significant event, and it's a sad event, and the commission understands that." So in an effort to avoid that fate, how can individual colleges in New England work at ensuring a sustainable future? Brittingham said the people with whom a college surrounds itself are critical. "I would make sure that I had a governing board that had abundant talent around the table, people who cared about the institution," Brittingham said. "I'd want good legal advice, I'd want very solid financial advice. I'd want people who are experts in communication, experts in strategic planning. If it were a college that had a very special focused mission in a particular area, I'd want expertise about that." 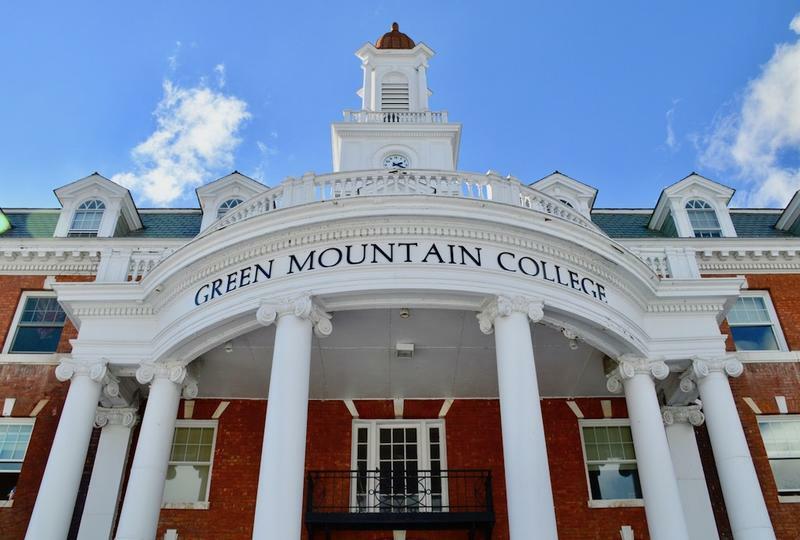 Green Mountain College is one of three Vermont schools that will close or stop teaching at the end of the current semester.